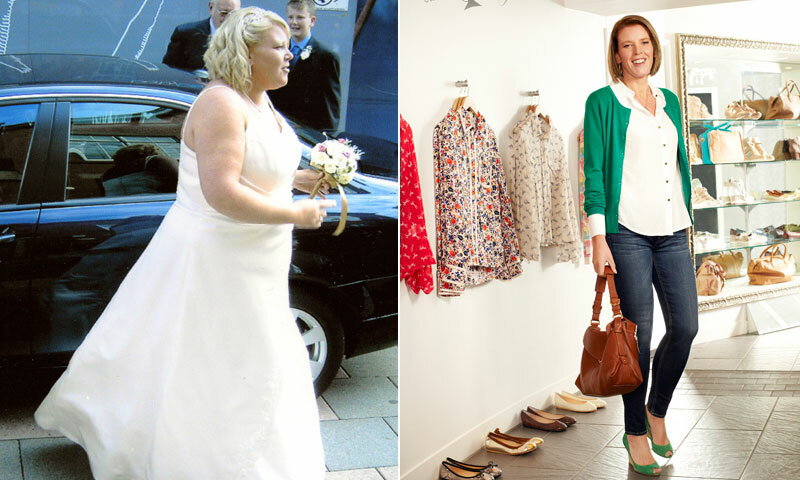 How I Gained It: I'd never known what being slim felt like. I was a big baby who grew into a chubby child, and then a tall, overweight teenager. I was fairly confident, though, so I developed a larger-than-life, jolly personality -- partly to make sure that people laughed with me rather than at me. I met my husband when I was about 18. My weight wasn't important to him, so I never felt any pressure to diet. It was only when I got up to a size 22, after our son Gareth was born, that I started to feel very heavy and uncomfortable. Two more children followed in the next four years and the weight stayed on. As I hit my mid-30s, I also worried about how my size was affecting my mobility. Although I didn't weigh myself, it was clear I had gained even more weight because my size 22s were much too tight. I had also developed a degenerative disc problem, which made me even less active, because at any moment I feared my back might spasm. Breaking Point: Having an MRI to determine the extent of my spine problems was one of the most traumatic and embarrassing experiences of my life. The hospital staff members were concerned that I wouldn't fit into the scanner, so they used padding to make sure I didn't get trapped. Even so, I had to be eased out gradually by two staffers. Then, in January 2012, I was at my job as a hospital aide when I split my size-26 pants. They didn't make uniforms in my size, so I had to endure the humiliation of a temporary repair with a stapler. As I sat in the break room, very upset about the situation, a nurse named Lynne -- who'd recently lost more than 50 pounds -– came in and said she'd like to tell me how she lost her weight, but she seemed skeptical that I'd commit to it. How I Lost It: I don't know why, but the idea that nobody at work thought I would take weight loss seriously was an irresistible challenge. That same evening, I joined Slimming World, which was the program that Lynne had used to lose her weight. Right away, I learned so much about healthier eating. And I know that you can occasionally have a cookie or doughnut on the eating plan, but the weirdest thing happened: I discovered fresh fruit and vegetables and got hooked on them instead of sugary snacks. Within three weeks I was almost 15 pounds lighter. The support I felt from the Slimming World team was also very helpful as I continued to lose weight. They were there to cheer me on when I had a great week, while at the same time walking me through the weeks that perhaps didn't show an improvement. I never felt like giving up, thanks to that kind of encouragement. I knew that combining exercise would also help, too. At first, just parking a bit farther from work was a struggle. But I persevered, and soon I could slowly manage the two-mile walk uphill. Now I can easily do it in 30 minutes, and I've also added Zumba classes to my routine. I did not set out to lose 146 pounds. Because I've never been slim, I originally would have been pleased to just get down to 250 pounds or so. Then I discovered that I could cook my own delicious recipes instead of ordering takeout, or to swap chocolate for fresh strawberries and grapes. But after a few months I reintroduced some of my favorite foods -– such as chocolate -– just to see how I would cope. To my amazement, I was able to buy a package of doughnuts and enjoy one while putting the rest away. I would have never been able to do that before, which shows how much my tastes have changed. Looking back now, I know there are so many things I never did with the children –- jumping into the ocean with them on vacations, going on bike rides, running around -– because I was worried about how I might look. Today, family activities are not only easier, they're much more enjoyable. Then there are my coworkers, who never thought I'd take this seriously. We're now swapping healthy eating tips, and they love that they've been proven wrong. After photos courtesy of Slimming World magazine/Su Forrester.